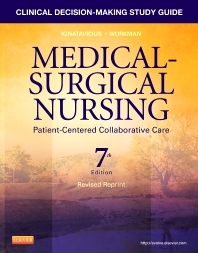 Designed to accompany Ignatavicius and Workman's Medical-Surgical Nursing: Patient-Centered Collaborative Care, 7th Edition, this study guide helps you understand and apply material from each chapter in the text, and gives you added support as you learn to make safe and effective clinical decisions. Study/review questions provide a review of key content using a variety of question formats, including a high percentage of questions in traditional and alternate NCLEX® Examination formats. Answers are provided in the back of the book. Case studies in most chapters give you the opportunity to apply higher-level thinking skills to true-to-life clinical scenarios.